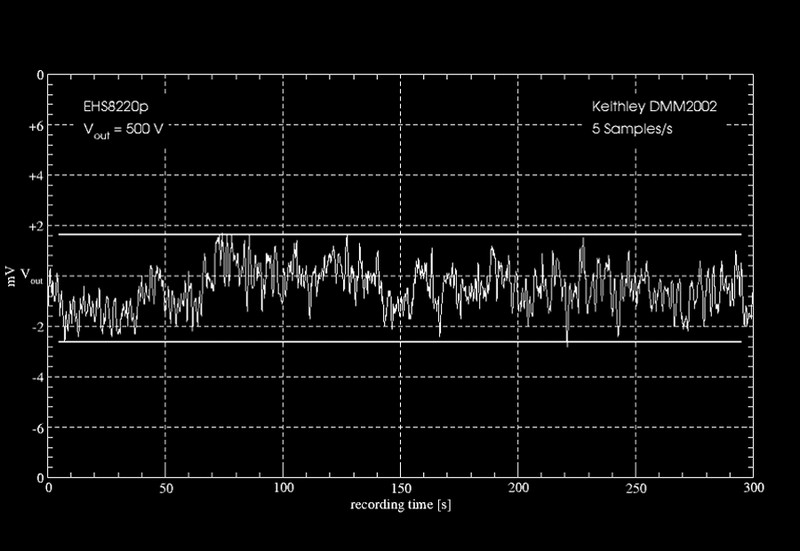 The fundamental oscillation of the converter, which is in the region of 40 to 120 kHz. The filters in all modules are designed to keep this component below 5 mV at full-load, in most module types even below 1-2 mV. Since this component depends on the load it decreases significantly if the load is reduced. Noise caused by non-ideal electronic parts (finite time constants, finite amplification, ground noise) in the control circuit. 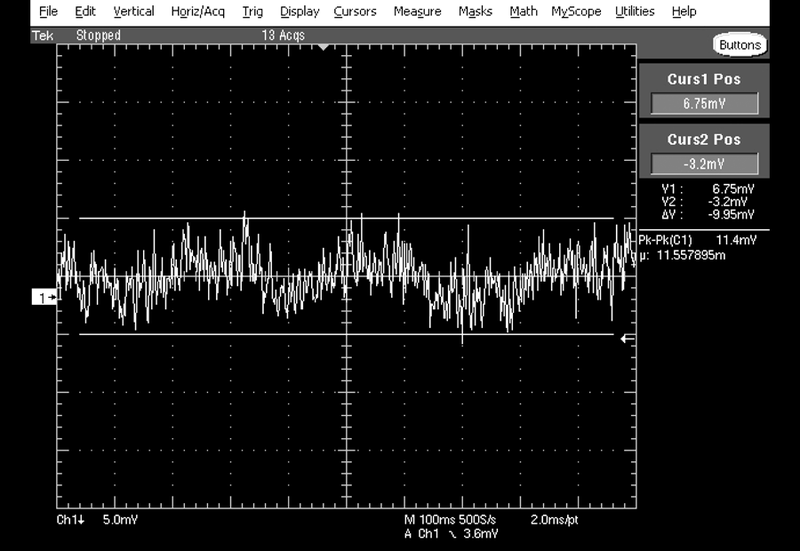 The frequency of this noise component is in the range of 10 Hz up to a few kHz. Typically this component is below 10 mV, for Standard and High Precision modules with a maximum output voltage up to 4 kV it is below 3 mV. This is achieved by using a dual circuit control for the output voltage, which also guarantees a very good stability of the output voltage under all load conditions. The frequency interval from 10 to 0.01 Hz is typically not very relevant for spectroscopic applications. In this range a ground noise of analoge parts of the reference voltage generation and control circuits, typically of the order of nanoor microvolts, can result in a noise of some 10 millivolts in the output voltage due to the large amplification factor (> 1000). In case these low frequency noise components may interfere with an application, e.g. 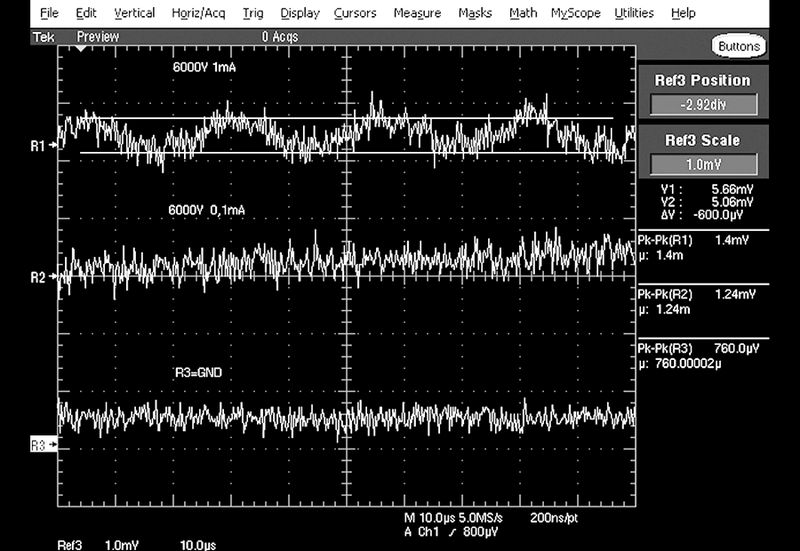 for electron-optical implementations, low-noise high precision modules should be employed, which keep this noise component below 5 mV. Below those frequency ranges a change of temperature can lead to a drift of the output voltage. The operation mode „DAC fineadjustment“ allows to supress this drift to a greatest possible extend.